Welcome to the amazing career and wartime development of the long range Ju-390 aircraft. 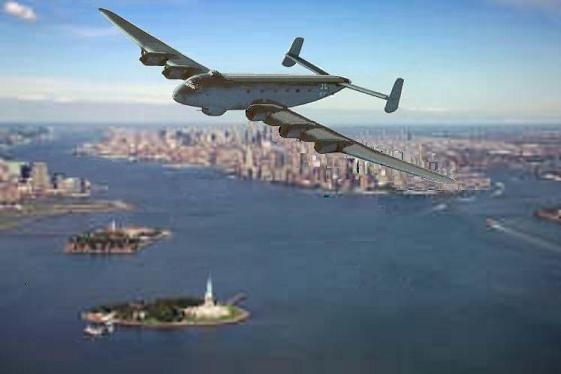 A super secret aircraft flown in missions to new York, Cape Town, Buenos Aires and Tokyo. The aircraft which Wikipedia editors keep censoring the truth about. The Ju-390 traces it's lineage through development of Ju-290, Ju-90 and Ju-89 types, so here my website devotes pages to all aspects of the family of aircraft which it evolved from. I tell this story here because no matter how much evidence one produces, so called historians and the editors at Wikipedia suppress and censor them in the true style of Nazi dictators, because it does not fit their preferred view of history. Two prototype aircraft were flown. A third prototype was built and paid for. indeed Junkers received payment on 29 June 1944 for seven completed prototypes. We would not even know a second prototype flew except that a British Merchant Marine sailor in the Mediterranean in 1943 snapped a photo of the aircraft attacking his ship, now known by it's registration, RC+DA. Such was the long range capability of the Ju-390 that it quickly found a niche for special missions. The so called Bell itself is another aspect of history shrouded in disinformation. I maintain on another of my websites that this was a kind of particle accelerator used for the Nazi Atomic weapons program. When Argentina created it's own nuclear program in 1947 at remote Lake Nahuel Huapei, close to the Nazi populated town of Barriloche, It was the same device which they had offloaded from the Ju 390 at El Palomar which formed the basis for the Argentine project. My correspondence with Richter's son in law Omar Dipasquale reveals that Richter's laboratory was initially set up at the Aviation Research Institute at Cordoba, where the British used a bomb attack to sabotage the project in 1947. In 1956 Dr Richter made a job application to the United States Air force in which he described his "reactor" at Nahuel Huapei as a Tokamak using ultrasonic sound waves to control a pure fusion reaction between Lithium and Hydrogen. Richter's job application apparently was so sensitive that it remained classified until April 1999. This Ju-390 flight to Argentina challenges conventional historians who argue there was only ever one Ju 390 flying. The first Ju 390 aircraft was left derelict at Dassau airfield in November 1944 whilst a second aircraft continued to be flown, mentioned, or sighted by several individuals during 1945. Somewhat inconveniently for those who deny the existence of a second aircraft, accounts and sightings of Ju 390s in 1945 continued and even photos of a second aircraft in flight emerged. Skeptics stoop to any level to try and discredit the the second Ju 390's existence calling myself and others liars, trying to link me with phoney beliefs in UFOs which I don't subscribe to, or false suggestions that I manipulate photos, none of which are true. The fact remains at least one Ju 390 kept flying after the one pictured above was retired from flying. Reluctantly Kessler & Ott the authors of a notable book about the Ju-290 family had to alter their story to accommodate emerging new evidence for this other aircraft which they previously denied with a new claim that it was not completed until September 1944, which is probably just as incorrect as their original flat denial. After Kessler & Ott had to change their story, now they can't explain why the second airframe was never found after the war? The explanation is quite simple. Just unpalatable for those who only want to admit to a kind of pre-packaged, pre-processed diet of WW2 history which the western Governments want us to know. An account of history which denies German efforts to use nuclear weapons and conceals the escape of certain key Nazis, possibly with the acceptance, or collusion of western Allies. The fact that more information which was previously kept secret keeps dripping out, itself suggests there was a reason for more than one party to keep the truth of WW2 classified for many decades. There is still no certainty we have all the facts even now. If there were no secrecy there would be no controversy. Classified intelligence reports from Argentina which only came to light in 1993, now suggest the second Ju-390 was flown from El Palomar to a jungle airstrip in Entre Rios province Argentina in May 1945 [ 2 ] and then to a German owned ranch in Uruguay near Paysandu. [ 3 ] [ 4 ] To cover the embarrassment of the aircraft's existence in Argentina as the Third Reich collapsed, it was broken up with parts dumped into the Rio Pirana. How do we know this aircraft which arrived in Argentina on 2 May 1945 was a Ju 390 and not some other type? The Berlin Document Centre has the interrogation report of SS Hauptsturmfuhrer Rudolf Schuster who witnessed the bell device being loaded into a Ju 390 at Bystrzyca Klodzka airfield in April 1945 for an evacuation from Germany. Schuster asserted that it flew from there to Bodo, Norway. [ 2 ] Abril Basti, author 2004 tourist guide "Nazi Barriloche"